Villas 4 Bikers can offer you the lowest cost for BMW motorcycle rental and accommodation in the Malaga area of Southern Spain. We have unlimited mileage available on all bikes and pillion passengers are free. Large groups also catered for. Villas 4 Bikers is your ticket to motorcycling in the Andalucian area of Southern Spain or further afield if you are up to it. Spain is a vast country and Southern Spain has some of the most stunning and scenic landscapes you will find in the world. You decide how long you wish to enjoy it! The bikes available are the BMW range of GS 650, GS 700, GS 800 and GS 1200. All bikes come with side panniers and top box. Cost is dictated by the size of bike, the amount of people who want to travel and the number of days you require the bike for. Each villa consists of 3 bedrooms, one bedroom has a double bed and is ensuite. The other two bedrooms have two single beds in each room. There is an open-plan sitting room/dining room/ kitchen. The patio doors lead out onto the patio area which have sun loungers and patio furniture alongside an 8m x 4m swimming pool. 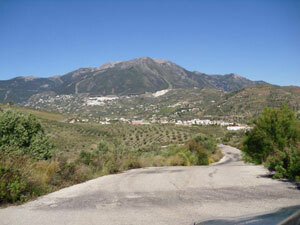 The villa is situated on one of the many foothills that surrounds Lake Vinuela. There are many little picturesque villages in the surrounding area……all within a 5 to 10 minute drive away. The local village of La Vinuela has a post office, a bank, a hospital, a pharmacy, a supermarket and many tapas bars and restaurants.